This model is discontinued. 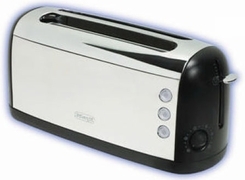 As an alternative, we recommend the DeLonghi RT400 4-Slice Retro Toaster with Brushed Metallic Finish. EXTRA-WIDE, EXTRA-LONG SLOTS WITH SELF-ADJUSTING BREAD GRIPS Toast a variety of breads û the slots have the length and width to accommodate a range of sizes, automatically positioning the bread for perfect toasting! CANCEL, DEFROST AND BAGEL BUTTONS WITH ILLUMINATION YouÆre in control! The BAGEL function is specially designed to ensure that the inside (70%) and outside (30%) of the bagel are perfectly toasted. The Defrost function thaws waffles, English muffins, and more. ELECTRONIC TEMPERATURE SENSOR Advanced electronic sensor monitors the temperature and adjusts toast timing according to internal temperature of the toaster, so you get consistent toasting results batch after batch. THERMOSTAT WITH SIX SETTINGS Choose your settings and toast to perfection! SLIDE-OUT CRUMB TRAY makes cleanup easy. EXTRA LIFT LEVER for easy toast retrieval. POLISHED CHROME with insulated sides. CORD STORAGE stows cord neatly out of sight.